Pioneers in the industry, we offer microprocessor double beam spectrophotometer from India. Spectrophotometer UV-vis Microprocessor Double Beam imported is a laboratory equipment that is used for analyzing absorbance levels and concentration levels of the liquids. These are greatly demanded for high accuracy and reliable readings and are required for various applications in different industries. Further, we are offering our products in customized options to meet client's requirements. 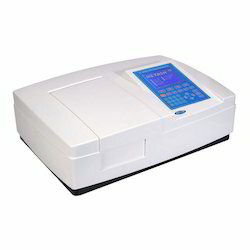 Looking for Spectrophotometer Uv-vis Microprocessor ?